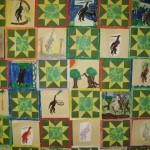 I am excited to share with you a few of the creative educational activities at Liberty Union-Thurston Elementary School in Baltimore, Ohio. These projects were done in relationship to my books in advance of my 2-day visit to their schools. They’ve had some great authors, including Ron Hirschi, who did stream walks with them some years ago. (In DECEMBER, they said. Cold toes but worth it.) 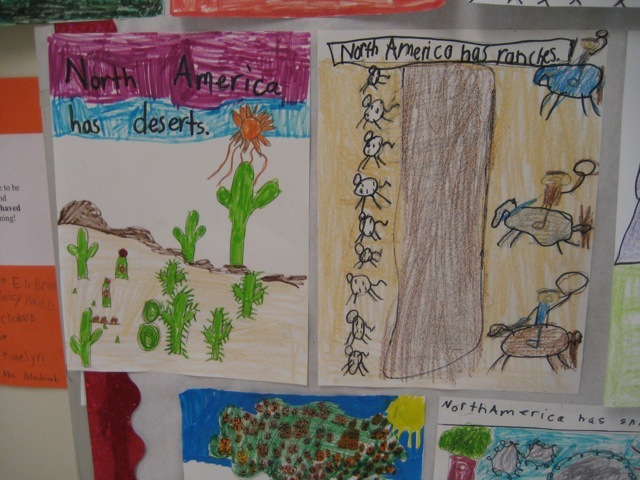 It seems they have an ongoing nature and stream study in this school. Hooray! 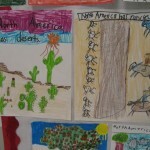 Kids will learn so much from seeing nature and science in action. Ah, the halls were festooned with beautiful bumblebees and flowers. A shiny paper mirror said “Look here to see the author.” How wonderful for each student to see a young author in themselves. 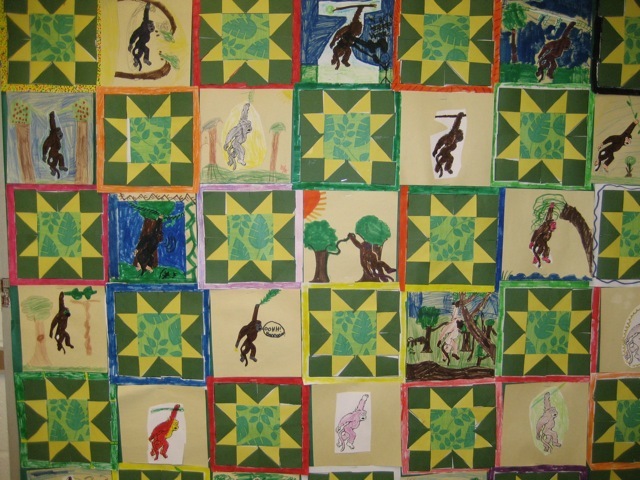 We had some of the first art celebration of He’s a Howler: a howler paper quilt. Beautiful! 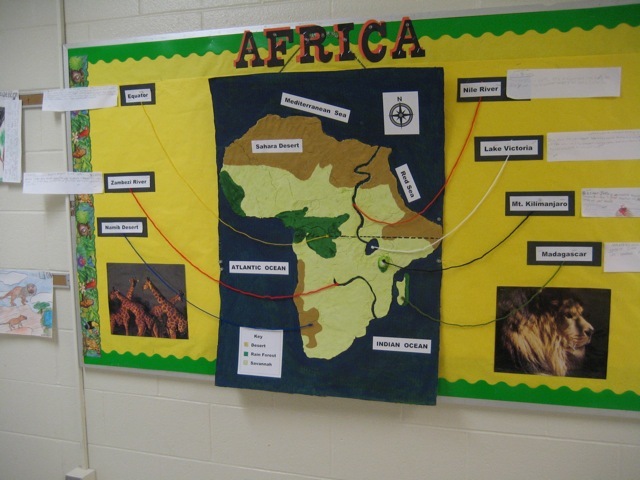 Many of the students were studying geography. 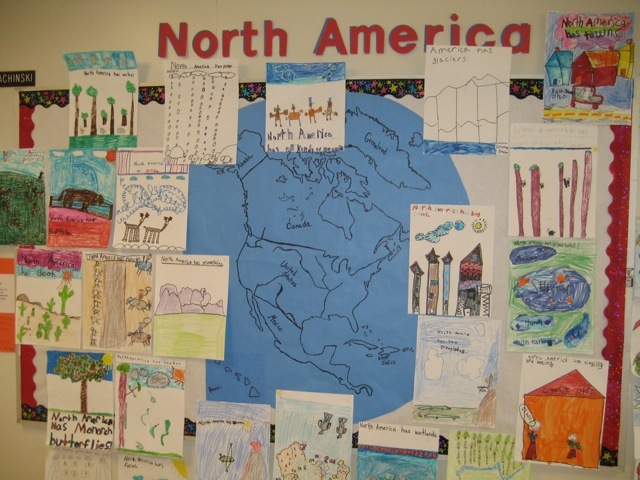 They had done drawings and short writing pieces about the features of continents to go with my continent books. 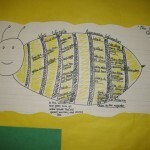 One classroom did a hilarious counting riff on One is a Snail, Ten is a Crab. They did counting by eyes. 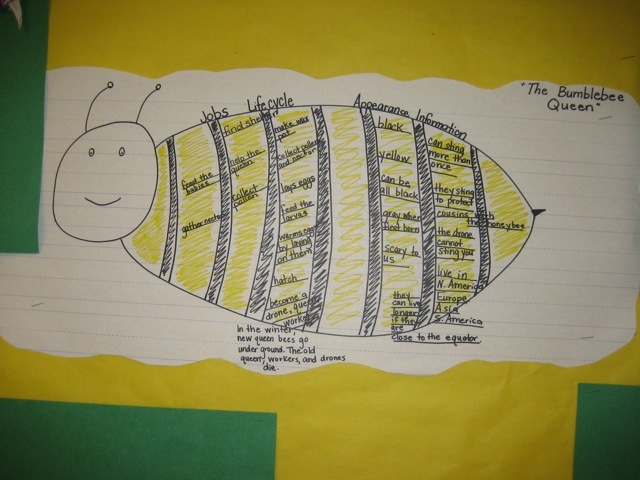 One class analyzed and classified the information in Bumblebee Queen. 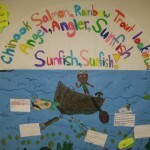 Another class created new versions of the fish chant but with ocean fish. 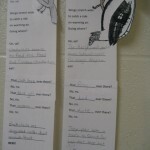 They created fish cutouts, wrote reports about features and behavior. Then they drew a fanciful sea/town scene where the fish swam. 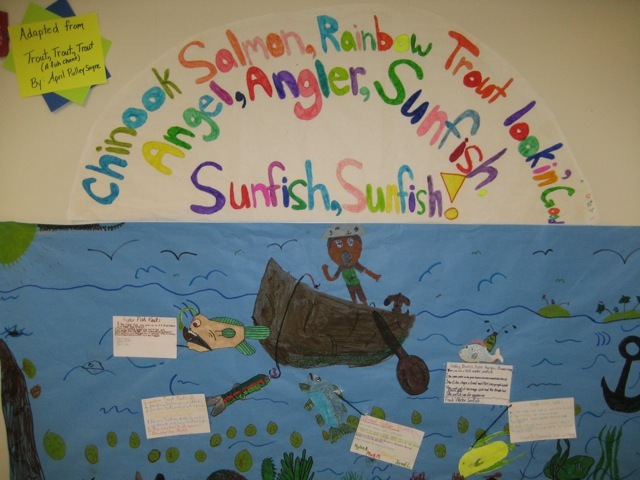 It was nonfiction with a visual fiction twist, in the spirit of Trout, Trout, Trout. Hooray! 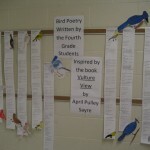 One of my favorites was the bird poetry written by the fourth graders. 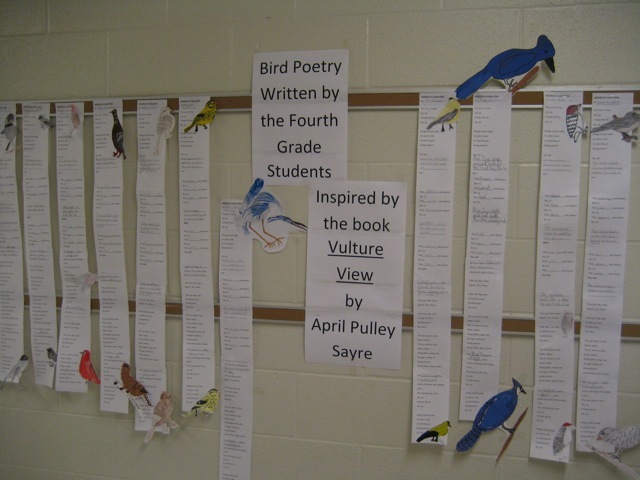 Using Vulture View as a model, the teacher had created a form with key words and phrases from Vulture View. 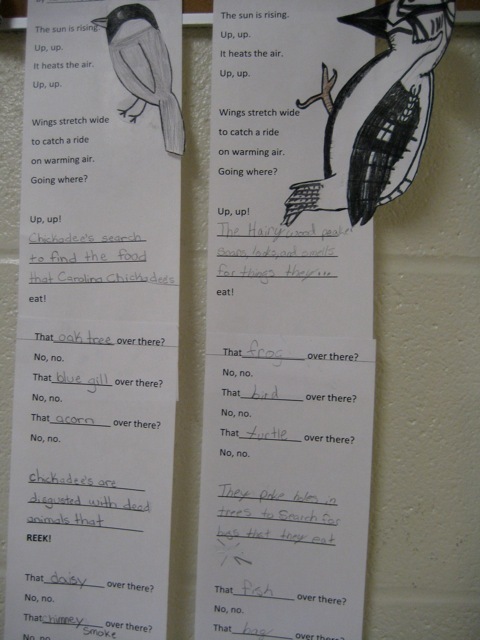 Students each drew a bird species and filled in what that bird would or would not eat and how it would move. Brilliant. A highlight of my visit was two small sessions with young authors and illustrators. I will never forget my discussions with them! I hope that Reading Rainbow Book entry goes well. 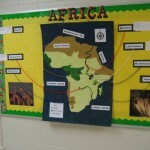 This is a fine school with energetic educators and students that are excited to learn. The students were well prepared for my visit and worked well together in the assembly setting. The faculty welcomed me. 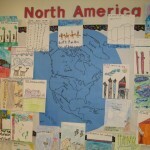 Students and staff have much to be proud of; together they have made an environment for learning. As an author, it was a pleasure to visit. Thank you, librarian Ms. Brown, for bringing me in to share this joyful place with you.